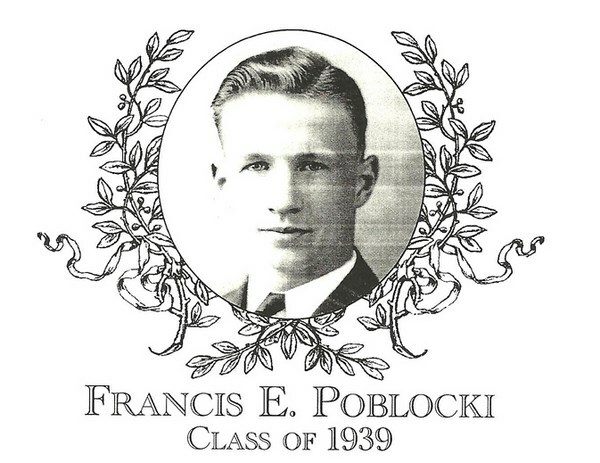 Francis E. Poblocki attended Bartlett High School from 1935-1939 and graduated in 1939. He was an impact player for the baseball, football, and basketball teams for each of those years. Francis played center for the Indian basketball team and was their captain for the 1939 season. Francis was a force under the boards on both offense and defense. On the baseball team, he was the starting second baseman for three years and played in the middle infield position with poise and grit. His hard play and determined attitude enabled him to be a contributing member not only in the infield but offensively as well. For the football team, Francis was the starting left end and a most memorable play for the Green and White came in the 1938 Thanksgiving Day Classic against rival Southbridge. With Bartlett holding onto a 7-6 lead, he broke through the line to block the extra point attempt ultimately securing a victory for the Indians. At graduation, Francis was award the Branch Medal for being a �three letter man� which was awarded to the top Bartlett athlete. Francis went on to attend the University of Alabama and graduated from Nichols College in Dudley. He continued to be active in athletics and played semi-pro basketball with the Polish Aces. Francis and his wife, Wanda, live in Vero Beach, Florida and they have three children, Carolyn, John, and Michael. He worked for over thirty years for both the Town of Webster Board of Public Welfare and the State of Massachusetts Department of Public Welfare before retiring in 1983. He was a long-term member of both the Webster Lodge of Elks and the Webster Knights of Columbus.